This year I was totally wooed by Hanna Andersson. I try not to order from the States – duty, exchange etc, but I didn’t see any point in spending less here on clothes that don’t stand up to everything my kids put them through. So I bit the bullet and splurged. In my defense, I did load my cart then wait and wait for a good sale to come along. And, i got an extra discount when I signed up to receive sale notifications by email. Win-win. Ordering to Canada was easy-peasy and it came fast – only a few days after I got my shipping notification. And, when it arrived I read there is a Canadian address for returns which would have made it super easy to send things back…if I hadn’t instantly fallen head over heels. So here’s the Hanna Haul for her: She only needed a few things for preschool – she grows so slowly that she wears through things faster than she outgrows them. Especially in the knees since she still ‘walks’ on them rather than her feet when she abandons her walker. The Hanna tights have so far lasted longer than any others we’ve tried. There is one more cute hoodie that came later. The one I wanted originally is sold out in her size. Sigh. 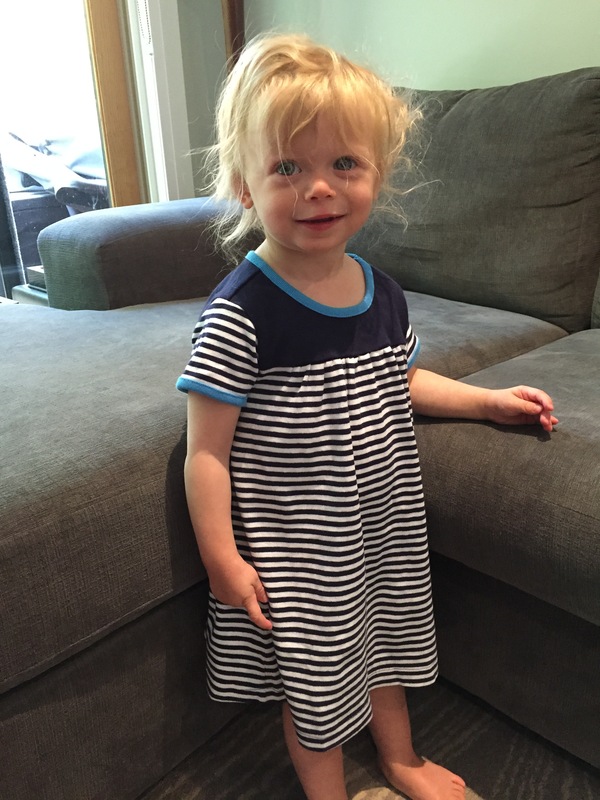 The little dress with the stripes is adorable. 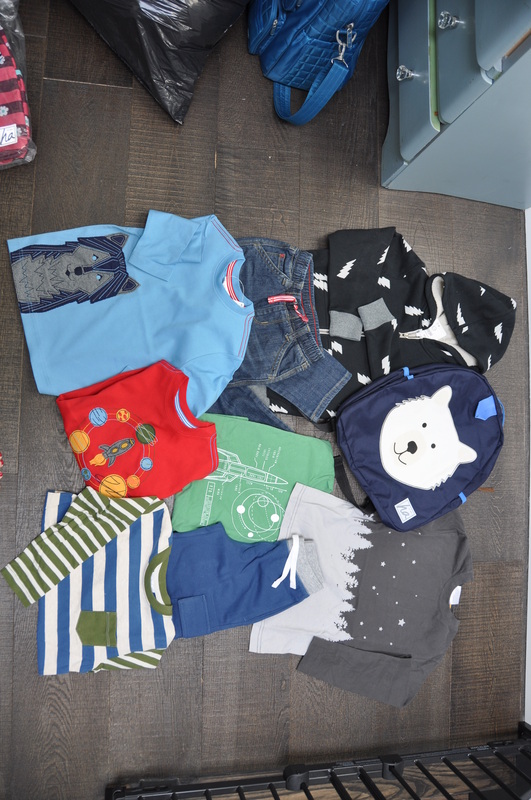 Hanna Haul for Him: The boy grows slowly and is in between two sizes so these should last well for him. Long sleeve shirts were his most urgent need, followed by some comfy pants. I very much like theHanna Andersson pull up pants which can be hard to find in stylish cuts. 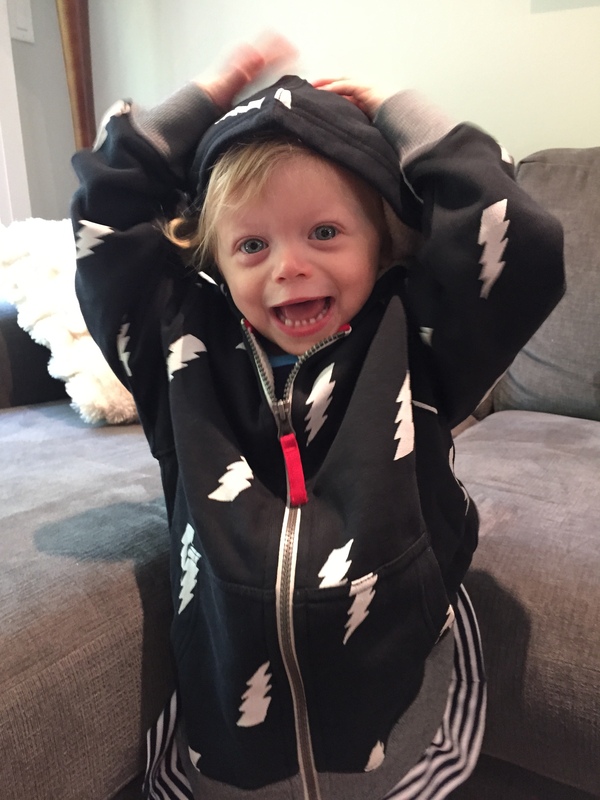 As he was being 5, there are no photos of him in his clothes, but his sis was happy to help. The hoodie is thick, warm, extremely soft and has a nice cut (obviously 4 sizes too big for this one). All in all, I’m totally thrilled with everything that arrived. 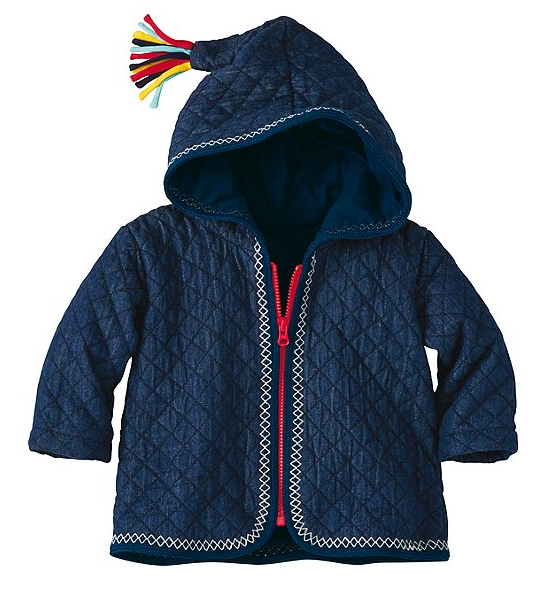 I am still pining for the Hanna quilted jacket that was sold out in her size so if you’re reading this Hanna Andersson – size 90 please. This is random, but I stumbled across your blog post looking for those black and white Hanna tights to go with a dress we have. If there is any chance your gorgeous little girl has outgrown now, and you are looking to sell them, please let me know! Hi Tina, we have the plain black and blue and white, but no black and white I’m afraid. Hi Melanie, thanks for responding! Sorry for the confusion, but I meant to say those blue and white ones then. If there is any chance you are interested in selling those (and those yellow bloomers too if your daughter has outgrown), please let me know!